TechZulu caught up with her and she reveals what it took to build the company up to what it is today. What inspired you to launch Vayable? When I was 20, I was in a carpet shop in Morocco telling the shopkeeper I wanted to visit the Sahara Desert. Before I finished my mint tea, I was in the back of a Honda Accord for 15 hours until we reached the desert where his cousin Ali was chief of the caravan tribe. We spent five days exploring the desert by camel. The modest amount of money I gave to Ali and his cousin for this once-in-a-lifetime experience that helped me gain a new understanding of the world was enough for them to live off of for a month. What moment turned Vayable into what it is? After college, I worked at the Daily Show. When we were off season, I would host friends and show them around New York, and I would travel myself. Throughout the decade after my stint in the Sahara, I traveled to more than 35 countries. Friends would come to me asking for advice, and I found myself planning vacations, honeymoons and more for them. Throughout all this planning, I found a hole in the the travel industry that needed to be filled. Between my own travel planning experience and my life-changing adventure with Ali, I came up with the idea for Vayable. Vayable uses science and psychology to match a traveler with a real local insider who is similar in personality. It combines the best of technology, science and human insight to host, design and book personalized experiences. How unique is it from the competition? Vayable experiences are personalized for you. Insiders who know your personality and are empathetic to your needs and style create your trips – no two trips will ever be the same. Vayable Insiders are trained to find unexpected experiences that will make your vacation both meaningful and unforgettable. How secure is the service or the user being hosted at strangers homes? Vayable Insiders are vetted and trained locals who design, book and host unique experiences all over the world. We interview each one, and every Insider goes through a training that includes 6 videos and 5 tests. They are required to agree to our terms of service before being connected to travelers. What is Vayable’s business model? 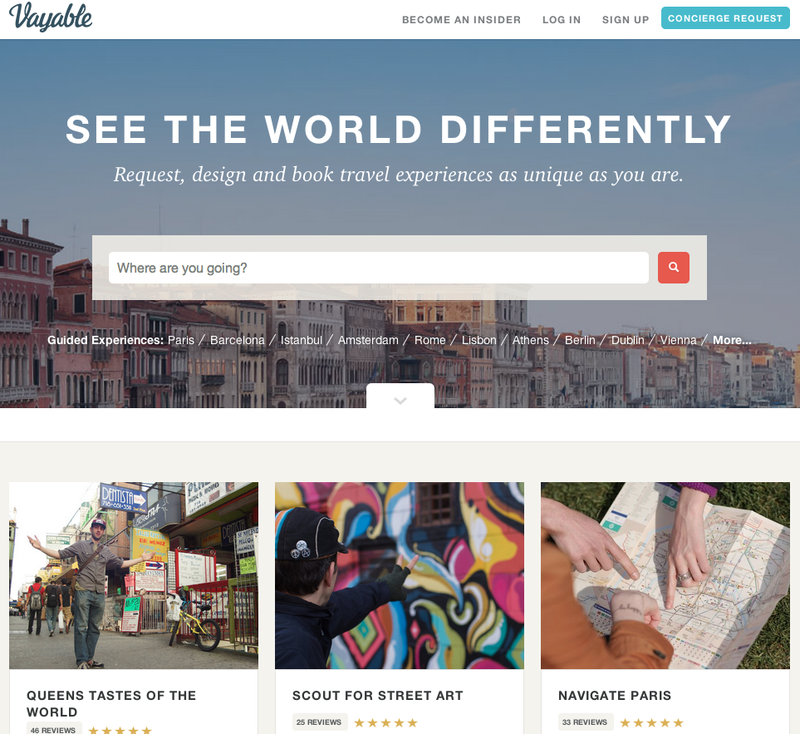 Vayable commissions a small percent off of a travel’s booked experience. What challenges have you had along the way and how did you solve them? We have a thriving community in Paris, and we were doing our best to build it and support it from San Francisco. However, we realized we had a better connection with our San Francisco community than our Paris community, simply because we see them face-to-face all the time. To solve this problem and co-create our product globally, we relocated the Vayable team to Paris for three weeks. It did amazing things for our business. We grew our community and sped up our product development cycle. Any plans to launch in more cities? 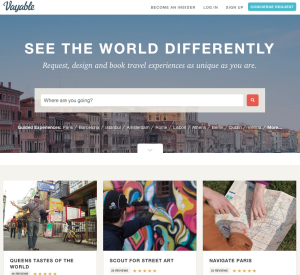 Vayable is already launched on a global scale in more than 500 destinations. Of course, we’re always looking for amazing Insiders everywhere to bring Vayable to their favorite spots. What is Vayable working on at the moment? Vayable is working on incorporating feedback from our pop-up headquarters to the user experience of our product as well as growing our community in key markets. Stay scrappy, even if you don’t need to. When we worked in Paris for three weeks, we were able to keep operational costs the same by partnering with British Airways and sub-letting our San Francisco office. Don’t shy away from creativity. Nowhere in the non-existent startup handbook does it say “uproot your team and work in Paris for three weeks,” but we gave it a shot, and it really paid off. Listen to your customers all over the world. Many startups fall prey to listening only to the wants of their San Francisco customer base, which can differ from what your wider customer base might want. Goals for Vayable in the next two years? Continuing to grow and build our brilliant Insider community.